We still have few September rods in the Hofsa river. The Hofsa has always been very popular with British and American rods. Some say it is the perfect salmon river. Just cast your line across the pool and the water will present the fly for you. 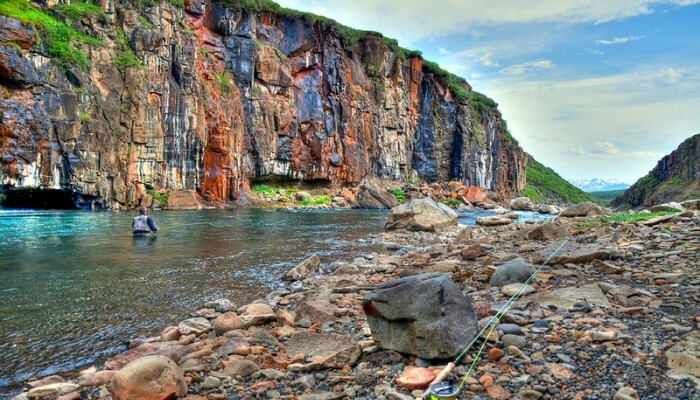 It drains a vast 1100 km2, and is 85 km in length, with 35 km of fishing below the great falls. The top beat is its most famous being the only beat in a canyon and requiring a drive along hanging tracks and walking to get to the uppermost pools. The salmon can only go as far as the falls at the top of beat one. The rest of the river is simply pool after pool of perfect fly water with snow-capped mountains in the background. Pools are long and wide with gravel bottoms and have many good lies. Half way down the valley the river is joined by the Sunnudalsa which is fished separately as is the very lower part of the main river for Arctic char. The Hofsa is a famous, much revered Icelandic river.